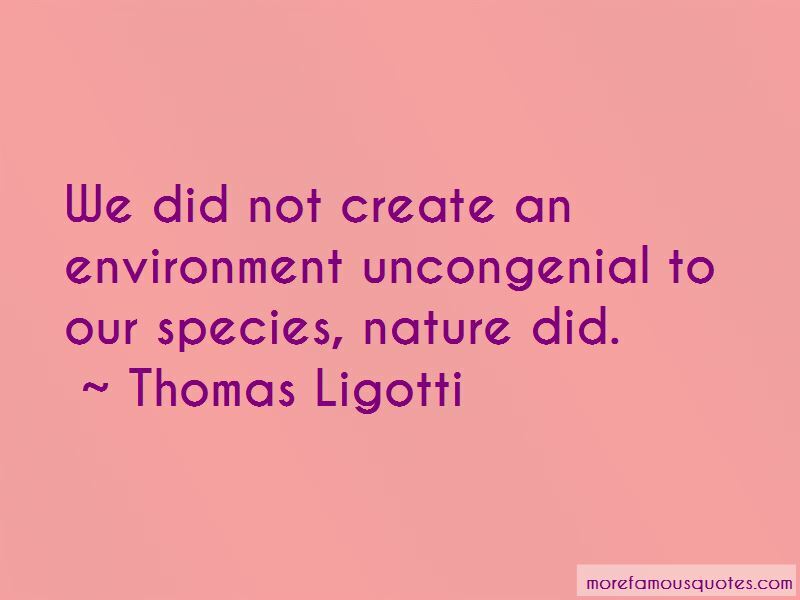 Enjoy the top 176 famous quotes, sayings and quotations by Thomas Ligotti. To say that some kind of god might exist is to vivify its being with mystery. To define a god into existence because it meets certain criteria for godhood is to kill that god by turning it into a cheapjack idol with a publicity team of theologians behind it. This would explain why so many deities-all of them, in fact-have fallen apart or are in the process of doing so: eventually every god loses its mystery because it has become overqualified for its job. After a god's mystery is gone, arguments for its reality begin. Logic steps in to resuscitate what has been bled of its healthful vagueness. Finally, another "living god" is consigned to the mortuary of scholars. The only way I can describe the visions I witnessed with even faint approximation is in terms of other scenes which might arouse similar impressions of tortuous chaos: perhaps a festival of colors twisting in blackness, a tentacled abyss that alternately seems to glisten moistly as with some horrendous dew, then suddenly dulls into an arid glow, like bone-colored stars shining over an extra-terrestrial desert. People get the biggest kick out of seeing the features of their faces plastered onto one head. “Unfortunately they failed to appreciate the best part of you, preferring to lose themselves in the labyrinth of your grosser illusions. Didn't I show our well-behaved audience an angelized version of you? And you saw their reaction. They were bored and just sat in their seats like a bunch of stiffs. Of course, what can you expect? They wanted the death stuff, the pain stuff. All that flashy junk. They wanted cartwheels of agonized passion; somersaults into fires of doom; nosedives, if you will, into the frenzied pageant of vulnerable flesh. They wanted a tangible thrill. “All of us had problems, it seemed, whose sources were untraceable, crossing over one another like the trajectories of countless raindrops in a storm, blending to create a fog of delusion and counter-delusion. Powerful forces and connections were undoubtedly at play, yet they seemed to have no faces and no names, and it was anybody's guess what we - a crowd of deluded no-talents - could have possibly done to offend them. We had been caught up in a season of hideous magic from which nothing could offer us deliverance. In plain language, we cannot live except as self-deceivers who must lie to ourselves about ourselves, as well as about our unwinnable situation in this world. How much I wanted to move into these rooms and live forever in this domain of medieval autumns and mute winters, serving out my sentence of life among all the visible and invisible wonders I had only dreamed about from so far away. In supernatural horror stories, however, magical thinking is a completely different matter. Those characters contending with what seems to be the work of magic will deny till the very last moment that anything magical is going on. They will invoke reason and evidence and eek out corroborations for the cause of their problems. But readers of these stories are rarely, if ever, on the side of these characters. They desperately want to believe that there is indeed something magical going on and they are primed to accept it whenever it occurs. Some readers especially enjoy a story with bad magic, as it assures them that magic is confined to fiction and will not leak into their real lives. This is the most perverse form of magical thinking and the one least likely to be recognized as such. There are enough fatalities of a mundane sort. Find a quiet place and wait for one of them to carry you off. 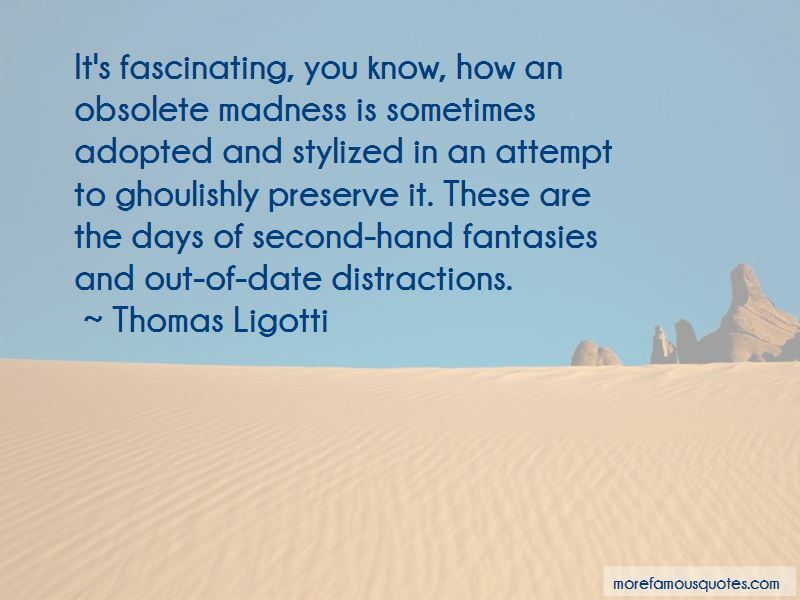 Want to see more pictures of Thomas Ligotti quotes? 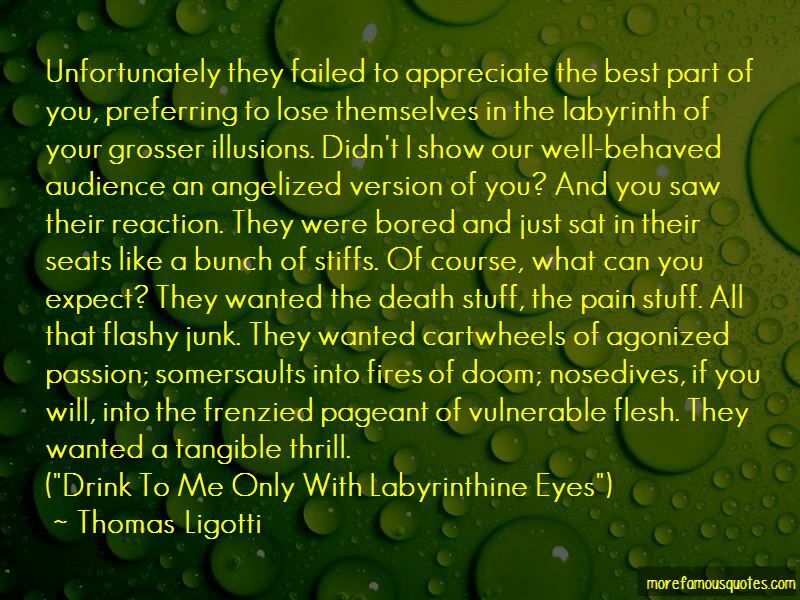 Click on image of Thomas Ligotti quotes to view full size.